Researchers at Brigham and Women’s Hospital (BWH) and Carnegie Mellon University have introduced a unique micro-robotic technique to assemble the components of complex materials, the foundation of tissue engineering and 3D printing. Tissue engineering and 3D printing have become vitally important to the future of medicine for many reasons. The shortage of available organs for transplantation, for example, leaves many patients on lengthy waiting lists for life-saving treatment. Being able to engineer organs using a patient’s own cells can not only alleviate this shortage, but also address issues related to rejection of donated organs. Developing therapies and testing drugs using current preclinical models have limitations in reliability and predictability. 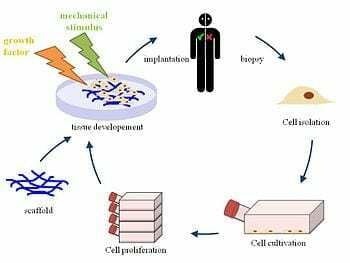 Tissue engineering provides a more practical means for researchers to study cell behavior, such as cancer cell resistance to therapy, and test new drugs or combinations of drugs to treat many diseases. The presented approach uses untethered magnetic micro-robotic coding for precise construction of individual cell-encapsulating hydrogels (such as cell blocks). The micro-robot, which is remotely controlled by magnetic fields, can move one hydrogel at a time to build structures. This is critical in tissue engineering, as human tissue architecture is complex, with different types of cells at various levels and locations. When building these structures, the location of the cells is significant in that it will impact how the structure will ultimately function. “Compared with earlier techniques, this technology enables true control over bottom-up tissue engineering,” explains Tasoglu. Tasoglu and Demirci also demonstrated that micro-robotic construction of cell-encapsulating hydrogels can be performed without affecting cell vitality and proliferation. Further benefits may be realized by using numerous micro-robots together in bioprinting, the creation of a design that can be utilized by a bioprinter to generate tissue and other complex materials in the laboratory environment. “Our work will revolutionize three-dimensional precise assembly of complex and heterogeneous tissue engineering building blocks and serve to improve complexity and understanding of tissue engineering systems,” said Metin Sitti, professor of Mechanical Engineering and the Robotics Institute and head of CMU’s NanoRobotics Lab.